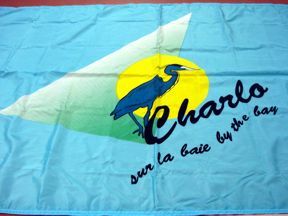 The flag of the Village of Charlo, New Brunswick is turquoise with village logo on it. The Great Blue Heron was chosen as the visual symbol of the Village of Charlo because of its plentiful numbers in the area. The Great Blue Heron is one of Canada's most spectacular birds. It aptly symbolizes the marine and aquatic milieu along the shores of the Bay of Chaleur. The yellow represents the sun, the green represents the forest and the overall blue turquoise represents the Bay of Chaleur. Information and photo of the flag thanks to Yvette from the Village Staff.